Welcome to Guddu and Rashmi's comedy of errors. The much-awaited trailer of Laxman Utekar's Luka Chuppihit the Internet on Thursday afternoon and it is already trending on Twitter. 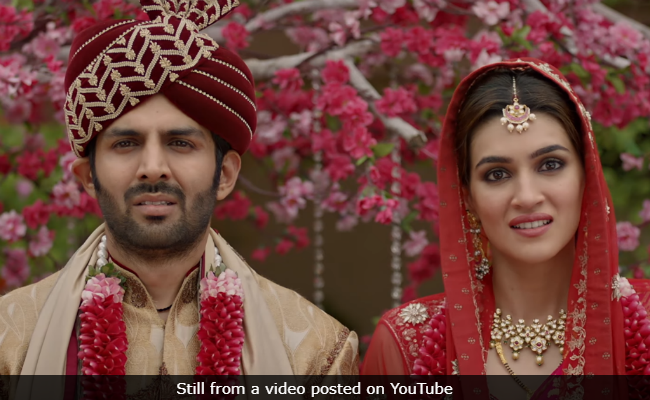 The film's cast is headlined by Kartik Aaryan and Kriti Sanon and we must tell you that the pair looks absolutely adorable together. The two-and-a-half minute video gives us an insight into the fun-filled yet equally crazy love story of Guddu and Rashmi (played by Kartik and Kriti ), who decide to get into a live-in relationship. However, much to their dismay, they end up involving their families and in the words of the makers, they "experience live-in saparivaar." Kartik Aaryan's swag, as always, is off the charts and so is Kriti's straight-face humour. Another highlight of the trailer are the epic one-liners by Aparshakti Khurrana, Pankaj Tripathi and Vinay Pathak. Ahead of the trailer's release, Kartik Aaryan shared a new poster on his Instagram profile. Kartik captioned the post: "Wherever this jodi goes, family follows." A day before the trailer's release, the makers of the film shared two posters of the film. In the first poster, Kartik and Kriti could be seen putting a finger on each other's lips, while Pankaj Tripathi, Aparshakti Khurrana and Vinay Pathak could be seen peeping from a door. Another poster featured the film's lead pair holding garlands in their hands. "Shaadi ke khel mein aayega twist, aakhir Luka Chuppi mein kya hai risk?" read the caption on the post. Luka Chuppi went on floors in August last year and it has extensively been shot across Mathura and Gwalior. The romantic-comedy has been directed by Laxman Utekar and it has been produced by Dinesh Vijan. Luka Chuppi is slated to release on March 1, 2019.